Students and parents around Orange County came to Sage Hill School on Sunday, December 16, 2018, to listen to another guest lecture series hosted by OCMC. These individuals had the opportunity to listen to Dr. Po-Shen Loh from Carnegie Mellon University and Pete Hua, a senior at Crean Lutheran High School. Pete began the lecture with a captivating talk on his journey in mathematics and volunteering. Pete also inspired the audiences with his unique life experience and his passion for STEAM subjects. 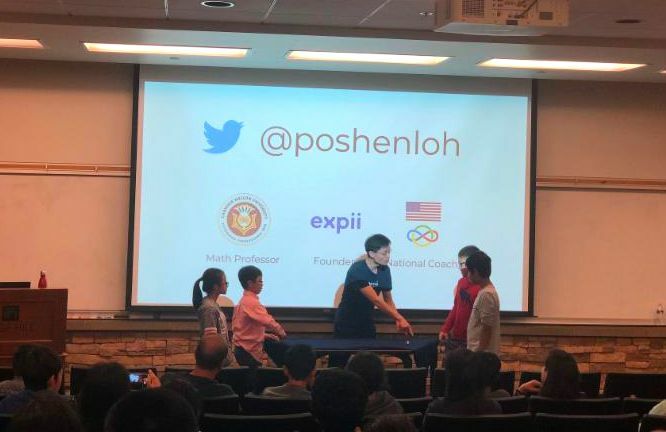 After a short break, Professor Loh, the national coach of the US International Math Olympiad team, started the second half of the lecture with an interactive dice game for the younger audience. He then gave a brief talk on the relevance of mathematics on games and strategies that left the audience shocked by the power of math. Both lectures gathered a high amount of excitement from the audience. OCMC would like to thank Professor Loh and Pete. See you at the next lecture series!